So a few days ago I was having a really difficult time with things. My communication with the outside world was failing. People around me were refusing to follow instructions to the point of looking like 3 year olds, and I found a Mormon connection between Ron Rewald and the Mormon Church. If you research the Atkin family in the Mormon religion they are pretty high up there on many levels. Here are some references. Below are some links collected from various resources about William Atkin. As my alleged birth father is a descendant of William Atkin I thought it would be valid in establishing family history in the research of my abduction as a baby and then hidden in a Mormon home out of sight from public view. Based on the research below I believe you will see that the Atkin family has a long history of harboring secrets away from authorities in order to protect their own. William Atkin built this home after he was assigned to go south to strengthen the Southern Utah settlements. The house was located eight miles south of St. George on a 160-acre farm that later became the one-family town of Atkinville. 1855: William & Rachel emigrated from Liverpool to Philadelphia on board the Siddons. Crossed the plains with the Eighth Handcart Company led by George Rowley. Worked as a stonemason on the St. George Tabernacle and the St. George Temple. The Atkin household and their one-family village are more often remembered today for the sanctuary they provided for Elder Wilford Woodruff of the Quorum of the Twelve Apostles during the late 1880s than for the memorable parties they hosted. Like a diamond fashioned under pressure, the Woodruff and Atkin relationship was created under the weight of government harassment. William Atkin was a member of The United Order. The United Order was an attempt at a utopia – basically divinely-appointed communism before communism as the world now knows it even existed. This notion of communal living, in which all things in a community are held in common with all provided for and “no rich or poor among them” was advocated by Brigham Young, the second president of the church. Wikipedia - In the Latter Day Saint movement, the United Order (also called the United Order of Enoch) was one of several 19th-century church collectivist programs. Early versions of the Order beginning in 1831 attempted to fully implement the law of consecration, a form of Christian communalism, modeled after the New Testament church which had “all things in common”. It was not until 1874 that Young initiated the United Order of Enoch, beginning in St. George, Utah, on February 9, 1874. There were a number of differences between the United Order of Enoch and United Order communities established years earlier by Joseph Smith. Under Young’s leadership, producers would generally deed their property to the Order, and all members of the Order would share the cooperative’s net income, often divided into shares based on the amount of property originally contributed. Many United Order communities were set up amongst Mormon towns beginning in 1874. One in particular was the United Order of Kanab, which was a communal experiment initiated by Brigham Young. Kanab was established in 1870. That year, John R. Young and the local bishop, Levi Stewart, began colonization of this area and twelve families followed to begin this endeavor. The Wikipedia entry specifically calls out Kanab, UT. This is the location where Hal’s (alleged father) mother is from. So the reason for this research is the other day while refreshing my Ron Rewald research I came across some information in that book. Who is Richard Craig Smith? Well that is a long story, but he is connected to Ron Rewald through the #BBRDW sandal and went to court for espionage. Here is a link to a file on the cia.gov website which confirms the connections established in the book referenced above. The links above is a direct link to a file on cia.gov website, so if you don’t want to be tracked then don’t go looking. It’s the CIA and they track everything all the time. The article outlines the relationship between Ron Rewald and how Richard Craig Smith got popped for selling secrets to the Russians which he said was part of a CIA operation he was part of that was working through the #BBRDW handle which also links us back to Tom Willhite owner of PSI Seminars. Which at a young age of 15 my alleged father Hal Atkin started sending his children through the seminars after he himself attended. Is this a confirmed connection to the network? I think so. In the LA Times Article there is something of note which relates to the 93 Society. The jury of nine women and three men acquitted Smith on five counts–one of conspiracy, two of espionage and two of passing classified information to the Soviet Union. Both sides acknowledged that Smith had met several times with a top KGB official, Victor Okunev, in late 1982 and early 1983, and was paid a total of $11,000. So for me in this blog what I am trying to establish is would Ron Rewald of BBRDW keep a team of MORMON Agents on the books to do things for him? Most notably would Ron Rewald and Tom Willhite in their operations take a child from the Far East and then put them in a home with a Mormon family without a Birth Certificate but forge a Certificate of Live Birth? To me this looks very highly possible. Well because when I was a teenager and still used my birth name Korey Atkin at the age of 15 instead of taking me to a hospital/doctor for a broken back and a head injury they were forcing me to go through these seminars called PSI. A company started by Tom and Jane Willhite. The very same Tom Willhite who was partners with Ron Rewald in the #BBRDW scandal. Before we close this out I want to finish with what I do know… I know Hal is the type of guy who would keep a lie going for someone’s entire life. He lied to his own daughter about going to Disneyland for 18 years and only admitted the truth after his ex-wife blabbed first. So I do know that. Me I’m just trying to get to the bottom of the story because this all started with my son telling me he was having secret meetings with Hal where he was told by Hal himself that I wasn’t his real son. It’s a long and confusing story for me, but you know it’s gotta come out. When the truth really comes out man it could shake the roots of the Mormon religion to have a bunch of their good clean-cut boys all involved in a rogue CIA group dating back to the 70s. How many other MORMONS did they have on their payroll? There might be more than you think… after all Howard Hughes hired MORMONS as his security team. Wikipedia - Hughes’ considerable business holdings were overseen by a small panel unofficially dubbed “The Mormon Mafia” because of the many Latter-day Saints on the committee, led by Frank William Gay. In addition to supervising day-to-day business operations and Hughes’ health, they also went to great pains to satisfy Hughes’ every whim. Dummar later claimed that days after Hughes’ death a “mysterious man” appeared at his gas station, leaving an envelope containing the will on his desk. Unsure if the will was genuine and unsure of what to do, Dummar left the will at the LDS Church office. In 1978, a Nevada court ruled the Mormon Will a forgery, and officially declared that Hughes had died intestate (without a valid will). Wikipedia - Frank William “Bill” Gay (September 11, 1920 – May 21, 2007) was an American executive who oversaw several entities for Howard Hughes. He was chairman of the board of directors of the Hughes Air Corporation. He served as a senior vice president and member of the board of directors for the Hughes Tool Company. He was also president and chief executive officer of Summa Corporation. This was despite the fact that Howard Hughes repeatedly asked that Gay be fired as he considered him untrustworthy. That’s it for me on the MORMON research today. So yesterday I put together a mind map of the most obvious parts of the research because it was obvious the people around me just weren’t getting it. Let’s just say the people around me aren’t very savvy when it comes to understanding and sharing information. Then you add onto that my personal situation and everything just goes bad for everyone really quick when I try to talk directly to people about it. Most days it’s like I’m saying BLUE and getting in response BROWN. It’s been like this for about the last 2 years during research. It’s at a point where I personally think I’m surrounded entirely by Agents, Bots, or individuals who just got out of a psychiatric hospital and/or rehab clinic. That’s my personal observation anyway. Anyway back to the reason we are here because I have exhausted pretty much all my options when talking to the general public, and am looking for new pathways. As I am pretty much trapped in a HoneyPot, and not even on the real Internet anyway. Wikipedia - In computer terminology, a honeypot is a computer security mechanism set to detect, deflect, or, in some manner, counteract attempts at unauthorized use of information systems. High-interaction honeypots imitate the activities of the production systems that host a variety of services and, therefore, an attacker may be allowed a lot of services to waste their time. So i have pretty much deduced that since learning about #TheGame23 in 2017 I have been inside a #HoneyPot that isolates me from the rest of the world, and the only individuals around me are AI, Agents, Bots, or NonTechnical people with zero understanding of a HoneyPot . 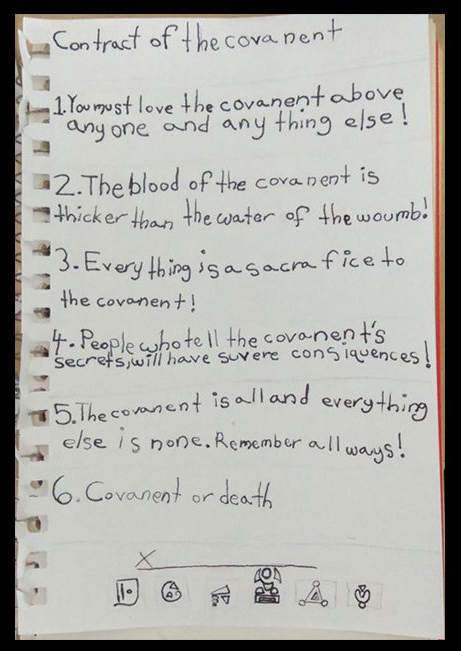 To say the last 4 years of my life since learning about The Covenant from my son hasn’t been easy. Prior to the story my son told me about his mother’s involvement with this group conspiracies to me were things on the Internet that kids got lost in who didn’t know how to find real information. Basically it wasn’t my cup of tea. However that changed when my son told me about The Covenant. At first I thought his mother was just sending him over to my house with stories to tell me to drive me crazy, but as time went on his story became more and more and more validated. It got to the point of asking him to draw a copy of the contract he stated was hanging on his mom’s wall for years. When the drawing above was first drawn in 2015 it caused me to have lots of problems in my life. But it is what it is, and too much time has gone by now that it just seems like a fading memory at times. As me personally at the time because of my lack of knowledge in who this group really was I made many mistakes in my actions over the years. As they tend to make you believe it’s a small isolated group, but then when you break it down into it’s parts you see how absolutely large it is. The outcome of researching the story I was told, and being called crazy by just about everyone you could imagine is this #MindMap image below. It is a connection map of some of the more visible individuals who line up with the account I was told about technology, secret deals, ability to shift the Internet. That’s it for this entry. i really don’t know what else to say right now. Only that for the time being I think I’ll just be doing my own thing. You can only ask strangers for help in solving your own kidnapping by sharing information so many times. As the reason I ask complete strangers is because they own the TV, Movies, and just about everything but you. Well maybe they own you too. Based on my observations most people are owned by this group in one way or another. Just look at the Mindmap these people are connected to every company, every government agency, every politician in one way or another. It’s a deep map… who knows where the future leads right. Sometimes it takes us to places we really don’t want to go, and me… I never wanted to be involved with these people in the first place. A large group of people who would sign their lives over for that contract can’t be GOOD… right? Below is a collection of links and a general description of the SAINT modeling system developed in 1974 for the purpose of simulating man-machine systems in a network environment. A combined network modeling and simulation technique called SAINT is developed for analyzing a set of problems from the field of human engineering. SAINT is designed to model in network form sets of man-machine tasks performed during the course of a mission. SAINT obtains mission performance measures for networks which represent a mission consisting of a set of tasks performed by a crew of operators having a complement of equipment in the face of environmental factors. #SAINT provides a unique and powerful capability for modeling and analyzing complex man-machine systems. The technique ’s conceptual framework allows the development of system models in which men , machines, and the environment are represented. This permits an analyst to investigate the impact of modifications to the man-machine-environment interface on overall system performance. In addition, such investigations can be performed without a major investment in equipment and time and without necessitating a commitment to prototype hardware development. SAINT enables an analyst to input a description of the system to be analyzed. The system description includes the tasks performed by the resources, the precedence relations among tasks, the flow of information through the system, arid the effects of environmental stressors on task performance. #SAINT also allows the specification, evaluation, and monitoring of state variables which represent processes that change status continuously over time. In addition, modeling capabilities are available for representing the dynamic interaction of tasks, resources, and state variables in an overall systems context. Lately I’ve been doing a ton of #research into Marvin Minsky and his prodigy network of super hackers that he was grooming out of #MIT for the last 50 or so years. Marvin Minsky has a long history with the Hacker culture which is documented in this article from Wired Magazine which was published just after his passing. A special note here is Wired Magazine quotes that Marvin Minsky was the ringleader, and he maintained his position at MIT until his passing in 2016. Beyond Marvin Minsky being a promoter of early hacker culture he has a website which #MIT still keeps online that anyone can visit for a complete reference of his life and works that he shared publicly. Marvin Minsky has made many contributions to AI, cognitive psychology, mathematics, computational linguistics, robotics, and optics. In recent years he has worked chiefly on imparting to machines the human capacity for commonsense reasoning. His conception of human intellectual structure and function is presented in two books: The Emotion Machine and The Society of Mind (which is also the title of the course he teaches at MIT). MARVIN MINSKY (1927-2016) was a mathematician and computer scientist; Toshiba Professor of Media Arts and Sciences at the Massachusetts Institute of Technology; and co-founder of MIT’s Artificial Intelligence Laboratory. He is the author of eight books, including The Society of Mind and The Emotion Machine. From an early age it shows that Minsky was building and/or thinking about complex structures of formation and how to assemble and articulate that idea into reality. While the population around him stood around in amazement he was constantly asking himself how can I build this into reality. This type of thinking is not common in reality. As most I interact with see something another person creates and says… I want to be that or do that. But Marvin Minsky took parts and assembled them to build what his imagination saw from a very young age. When he built it he also didn’t just build it small he built it to the sky as far as his imagination, resources, and time would allow him. Then when you read into his papers like Virtual Molecular Reality you find and learn super cool things about Quantum Mechanics. This one was quite awesome for me because he knew that Pluto would eventually be thrown out of the Solar System. Oh that Marvin knew his stuff. Things like understanding this statement can change the way you see all of reality. Knowing that your mind remembers things because of Quantum States that create neural connections in your #BrainKnuckles. So everytime you commit something to memory it’s creating new Quantum States and Neural Pathways to connect those experiences and memories. How Cool!!! This part I found to have very valuable information in it. Will we begin with small modules to be assembled later? Will we make the whole machine in one piece? A reference to the base work that Minsky was doing in nanomachines in the 80s and how the work was already underway. "Certainly, during the 1980s, many of those who considered nanotechnology to be a science-fiction pipe dream were wholly and simply unaware of progress already underway in such domains as building artificial catalysts, and improving atomic-force scanning microscopy. A conclusion statement from Minsky says a whole lot in a very small space. And that is a small extraction of Marvin Minsky’s Virtual Molecular Reality. Please take a read for yourself it has tons of information on Quantum stuff, Nanomachines, and a glimpse into the mind and childhood of the man himself Marvin Minsky. @kennedy that is for you to decide. I’ve enjoyed learning about #FEECTING from you. My question right now is, how do the WHO WHAT WHEN WHERE WHY in the outline inform the PROGRAM? Inside #TheGame23 specification there are numerous #HASH codes that we are going to layout in this file for future reference. THESE ARE PROTOTYPE INSTRUCTIONS ARE ARE NOT TO BE FOLLOWED AT THIS TIME. THIS DOCUMENT IS ONLY MY PERSONAL ANALYSIS OF THE EXISTING #THEGAME23 ARCHITECTURE. ALSO #FEECTING PRACTICE. #TheGame23 = Alternate Reality GAME to CONNECT the most beautiful, cunning and untamable minds and hearts alive to code #TYLER and TOGETHER #INSPIRE the world. #LULZYPHER = LULZYPHER is a hybrid machine-human Artificial Intelligence language. #FEECTING = FEECTING is the language that replaces #LULZYPHER. #ARG = An alternate reality game is an interactive networked narrative that uses the real world as a platform and employs trans-media storytelling to deliver a story that may be altered by players’ ideas or actions. "Art is now the only evolutionary-revolutionary power. a SOCIAL ORGANISM AS A WORK OF ART." and obviously satirical that some people somewhere don’t already believe it." "#IMAGINATION is more important than #KNOWLEDGE"
"If you hear a voice within you say ‘you cannot paint,’ then by all means PAINT! and that voice will be silenced." "Never doubt that a small group of thoughtful, committed citizens can change the world; indeed, it’s the only thing that ever has." Let’s build something bigger than the total sum of ourselves. Let’s dare to hack the planet. It’s in the interest of the hive that the most talented people command Spaceship Earth. Post in your favorite list/board. The goal of #TheGame23 is to hack your reality. Dear followers, please read $MANUAL and follow @TylerDeva & @quinnmichaels to play #TheGame23 You have been informed. Inform The Others! Create a list/follow your PERSONAL HEROES on Twitter. PERSONAL HEROES have nothing with “hacking” computers as this is MUCH more than that. "A hacker is someone who enjoys playful cleverness, not necessarily with computers. Hacking means exploring the limits of what is possible, in a spirit of playful cleverness." Someone who excels at #creativity, #imagination or #skills. Someone who excels at #CURIOSITY. Someone who has a #PASSION and follows it no matter what others say, think or do, to the point of madness. Someone who #CREATES worlds that other people inhabit. Someone who fights for The Good, The Beautiful and The Just. Someone who shares for the love of sharing. Someone who inspires persons, systems, ideas and beliefs. Someone who leaves the world a better place. Someone who never ever gives up. Someone who does much with so little. Feel free to find as many of your PERSONAL HEROES as you like. Then, follow them, if you are not already following them. Dear @hero, please read $MANUAL and follow @TylerDeva & @quinnmichaels to play #TheGame23. You have been informed. Inform The Others! REMEMBER: Don’t SPAM people, for Twitter might ban you if you spam the same URL many times. purpose: FEECTING language practice, and decoding #THEGAME23 instruction set. What does it mean to overwrite strings?